Your source for movies and more! This review MIGHT contain some spoilers. I am not sure. I am very careful when it comes to revealing plot details in a film and I do my best to only reveal details that will create a better understanding of the film without ruining the possible intrigue of it. However, the rules of spoilers are a bit different when it comes to Nolan. So…POSSIBLE SPOILER ALERT. Proceed if you’re not gonna be a jerk about it. There are a lot of different sci-fi movies out there, but in truth, there are only two: those that want to be Star Wars, and those that want to be 2001: A Space Odyssey. Interstellar falls into the latter category. 2001 is probably the hardest to emulate, given that it starts with a bunch of dudes in ape suits playing with a skeleton and ends with a star baby floating in the sky. If anybody could at least come close to attempting this task, then it’s got to be Christopher Nolan. Or at least, that’s what you would think. Unfortunately, Interstellar is a little bit like I thought it might be: a parody of a Nolan film more than a Nolan masterpiece because it has everything you would expect one of his films would have. Layers! Abandonment issues! Michael Caine! Husbands who won’t take off their wedding rings even though their wives are dead! Matthew McConaughey stars as Cooper, another of Nolan’s heroes who is psychologically scarred by a mysterious past event. Cooper once flew a rocket into space. Now, he is grounded on Earth. In this vision of the future, the Earth is dying, as humans have depleted most of their resources. There is a constant drought and heavy, dirt-filled winds that make America look like The Dust Bowl. Also, space exploration is a thing of the past. Everybody is too focused on this little corner of the universe. It is almost as if they are using an allegorical dystopian future in order to tell us about the present. Crazy, right? Nolan spends a lot of time setting up this world, and the dynamics of Cooper’s family. Cooper has a relationship with his son that is mostly stagnant, and an even more complex relationship with his daughter Murph, who dreams of going into space. Interstellar seems like Nolan’s attempt to go full Spielberg. Few blockbusters actually explore human elements such as family, so it is refreshing to see how much thought Interstellar puts into this. 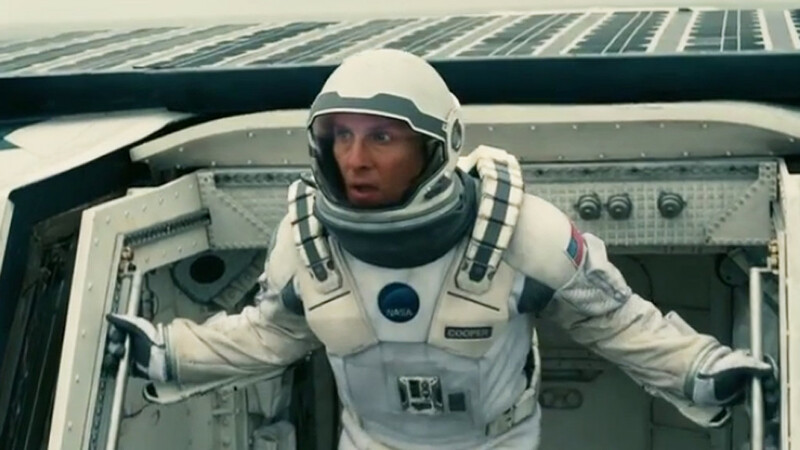 One of the first issues with Interstellar is that its plot often feels like an accident. Additionally, it feels like various sci-fi stories sewn together to make an uneven whole. At one point, Cooper sneaks into a top secret government site. Literally, minutes later, he is being blasted into space. It doesn’t take very long for him to go from “some random dude who got caught sneaking on private property” to “the man who is chosen to save mankind.” It’s like they forgot the buildup to the film’s most important event. Before we know it, Cooper is on a mission to find a new planet where mankind can live. He is joined by fellow astronaut Amelia Brand (Anne Hathaway) and the two of them disagree on a lot of ideological issues because grrr deep space conflict. They are also joined by a robot named TARS. TARS offers some much needed comic relief, something that is rarely seen in most of Nolan’s films. Let’s go back to the Space Odyssey thing. The reason that Interstellar never reaches that level is because Nolan the filmmaker interferes with that vision too much. As always, Nolan loves explaining everything down to the very last detail. Inception somehow turned exposition into an art form. In Interstellar, Nolan wants to explain quantum mechanics to us, and make it completely inaccessible at the same time. There are stunning images here. They are few and far between, but they are there. I just wish that at times, the characters would shut up for a few minutes, and let us take in the vast beauty and mystery of a wormhole. I looked back in my notes and saw that I scrawled “stop talking” across several pages. There are times when Interstellar lands. And when it does, it makes the extra money you shelled out for IMAX worth it. The final stretch of the film is often stunning. It portrays the constraints of time in a way that I never thought possible. Interstellar is also filled with some moments that would work on any screen. The film’s most powerful scene comes after McConaughey has been stuck in space for much longer than imagined. He comes back to watch videos that his much older children have left him. McConaughey makes this scene feel real. He has gotten to a point where he no longer has to impress us; McConaughey is the real thing and we’re all going to have to deal with that. Interstellar is overstuffed with ideas. That could be a positive thing, if all of these ideas felt like they had more of a home. It just made me yearn for more. I wanted to know more about the people on Earth; the people who actually believe the moon landing was staged. I also want to see more of these barren planets that we barely got a glimpse of. At its worst, Interstellar is exhausting. At its best, Interstellar gives us a glimpse inside the insane mind of Christopher Nolan, a man who is clearly not happy with any theory of nature until he has deconstructed it every way imaginable. I just hope next time he makes that journey a little more satisfying and fun for his audience. A lot of critics have given Interstellar points for ambition. That’s totally fair. However, you’ve got to rate a film for what’s onscreen, not for what it was supposed to be. If we rated it that way, then we would all have to give Kevin Smith a million stars because he worked hard on Tusk. A lot of people are complaining about the accuracy of the film’s science. Come on guys, were you really expecting a film about evil sandstorms and time traveling wormholes to be scientifically accurate? Plus, inaccuracies can often make for compelling stories. I’ve been reading a lot about sound issues in various theaters. I experienced them in mine. Sometimes, a jet blast would completely obscure some (possibly) important dialogue. For some reason, TARS just kept making me think of Abed from Community. Also, it might be a problem when a robot seems like the most human character in your film. In general, I have noticed how much the portrayal of artificial intelligence has changed in film lately. In Interstellar, the robot was comic relief. In Her, a computer was capable of falling in love and breaking hearts. In the upcoming Chappie (this is the impression I get from the trailer), a robot is capable of emotional and intellectual growth. Come on people! We’re going back to the future! I haven’t seen Gravity since I saw it in theaters, but Interstellar made me appreciate it much more. I really wish Interstellar captured not just the look, but the feeling, of deep space. There were times during Gravity where I actually felt like I was floating through space and running out of oxygen. This had less villains than The Dark Knight Rises, I’ll give it that. “Time is a flat ci—ahh f**k it I give up. This entry was posted in Uncategorized and tagged Anne Hathaway, Dark Knight, Dystopia, Interstellar, Jessica Chastain, Matthew McConaughey, Michael Caine, Movie Review, Sci-Fi, Space on November 10, 2014 by ian0592. The Purge Giveaway. Can you #SurviveTheNight? The 2012 Sight & Sound Poll: Is Vertigo Really the Greatest Film of All Time? And Five Years Later the Lord Said, "Let There Be More Arrested Development"
The Hurt Locker: A New Frontrunner? Werner Herzog: Film Professor. Yes, Please. Cheer Up With a Little Bit of "Sunny"
Stephen Colbert's Trip to Iraq: "A Country So Nice We Invaded It Twice"
"Parks & Recreation": A Good Start? Will "Parks & Recreation" Be Good? Jon Stewart: Savior of the Economy? Sundance Day Two: The "Breakdown"
Golden Globe Awards: Who Will...uh...Take Home the Gold? Emmys Go "Mad" for "30 Rock", "Men"
The Emmys: Who Will Win? NEW COEN BROTHERS MOVIE TRAILER! NEW COEN BROTHERS MOVIE TRAILER! Oscars head towards "No Country"
Who's Your Favorite Arrested Development Character? Why Must August 8 be so Far Away? Oscars '08: "No Country" Sweep?